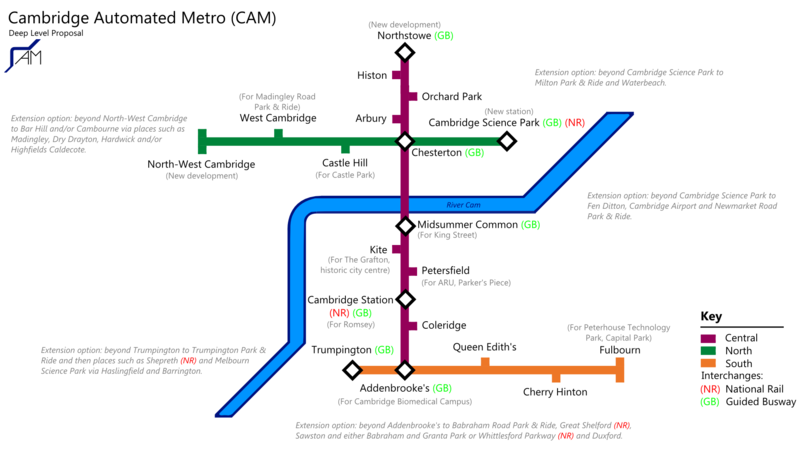 Following on from a post back in February, I had a brief go at imagining what an underground light rail system for Cambridge would look like (after all, Cambridge needs a bit more political ambition and vision). Maybe, with at least £1billion potentially being unlocked soon for transport in the Greater Cambridge area, something like this could be implemented – I certainly hope that it at least generates debate about the sorely needed transport investment in and around the city. While I haven’t done all of the analyses that I’d like1 (I’m not getting paid for this, unsurprisingly), I have tried to connect up a number of the hotspots highlighted on the map here with key transport links, attempted to avoid historic buildings (points at which the Cam can be crossed are somewhat limited by this) and given some thought to splitting the project into lines which also represent key stages2. As noted on the proposal summary below, I have assumed a deep-level system – a cut-and-cover system would add the additional constraint of generally following roads3. What an underground DLR-style railway for Cambridge might look like. Re-route the ‘Central’ and ‘South’ lines so that the ‘Central’ line serves (after Chesterton) Cambridge Retail Park and the Beehive Centre before proceeding to Cambridge Station, Addenbrooke’s and Trumpington while the ‘South’ line serves (after Cherry Hinton) Cambridge Station and Petersfield before terminating at Kite. Following on from the previous option, there would also be potential to have the ‘South’ line terminus further west near or in Lion Yard, the Grand Arcade or Cambridge University’s New Museums Site (which will soon be undergoing redevelopment). The modified ‘South’ line could go further west still before terminating, with the line crossing the Cam not far from The Fen Causeway (avoiding the colleges to the North of this) so that it can serve the Newtown, Mill Pond and/or Newnham areas and/or Cambridge University’s Sidgwick Site, before possibly meeting the North Line at West Cambridge. The proposal detailed in the map would be structurally closest to a X-system whereas the alternative detailed textually would be a Secant-system – the cities in which these can be found would suggest that the former is more suitable for a city and metropolitan area of Cambridge’s size and structure. Back-of-an-envelope calculations suggest that the number of stations envisaged should provide a London-like ratio of population to stations, ensuring financial viability. Obviously the city deal that Cambridge may get would significantly help with funding the constuction but there are other methods of raising money, depending on how much is needed and how aggressively adoption of the system is to be pushed. One aggressive solution for the phases depicted could involve city-wide parking restrictions that penalize overnight parking to ensure that the beneficiaries (residents of the city) are incentivised to use the system (residents who want a car for travel within Cambridge should put a garage-like facility higher up their list of priorities and those who need to travel by car outside of Cambridge could use the Park and Ride car parks for overnight parking). Further phases, to nearby towns and villages, could be funded via a city-wide congestion charge. However, if such an anti-car philosophy is being followed, it might be cheaper to simply convert most of Cambridge’s main roads into a tram-like surface-level light rail system, leaving enough roads for access (residential, commercial and emergency). 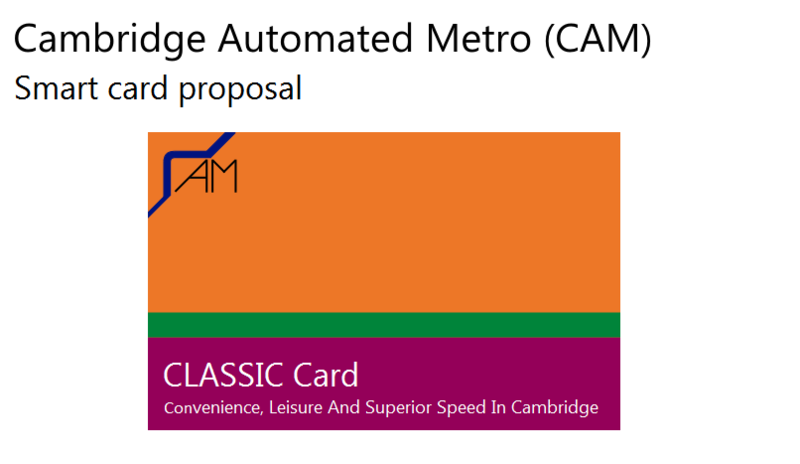 In the image below I’ve tried to envision what a smart card for the Cambridge Automated Metro (the equivalent of an Oyster Card) would look like. It uses the colours I’ve given the lines, to maintain a consistent look. It took a while to make the card not look too flag-like! Finally, have you noticed the new favicon that this website has had for the last few months? I updated it from the LocaMsg icon when I was doing early work on the Cambridge Automated Metro idea, coming up with logo symbol designs. The logos used in the images above, the favicon and a few more designs can be found in the image below. This entry was posted in Cambridge, Highlights, Transport by Mark. Bookmark the permalink. There is a job waiting for you at the Cambridge Municipal Planning Department. This looks well thought out and feasible. Indeed an apparently viable transport solution. Something the council has thus far failed to produce!! At least if they do introduce the congestion charge that they seem so hell bent on, a solution like this would actual provide a decent alternative to the car! Like every other bright idea someone comes up with, where is the money coming from to pay for it? We are still in deficit as a nation (i.e. we are spending more than we are collecting in taxes) so, pray tell where the money is coming from? Or is it a case of leftyist borrowing today and banckrupt tomorrow? I don’t know where the money is coming from, but it’s there. Great thinking and real dedication. Certainly worthy of further investigation in my mind. Funnily enough I designed (much more lightly I have to say) a PRT (Personal Rapid Transit) system recently as a part of my design degree. Running both above and below ground it carried passengers from the centre of town to a proposed pavilion gallery on Midsummer Common and on to Riverside. In my case all a lot of fun, but the thinking (semi underground light transit) was there. I really hope the powers that be take notice and start looking into a solution to the congestion. I think your research and thinking will help. Good Idea. Just read about it on CN site. As per the forum is full of Narrow minded twats that have a pop at anything that pushes the boundaries. Hope it leads to something. I have lived in Cambridge for 7 years and the traffic situation has got worse, it was bad when I got here! A tube system coupled with a connected city spanning offroad cycleway would be brilliant. I think its a great idea with some huge benefits to many people both those who would use it and those who don’t as it would deflate some of the high clogged roads in Cambridge. But I would like to see it go a bit further and out to Cambourne and surrounding villages to help take some of the A14 congestion away. maybe even a Park and ride set up. I think it would make Cambridge as a whole more accessible for everyone if it was run by the right people in the right way. If you check out a larger version of the map, you’ll see from the grey italic text around that I too would like to see it go out to places such as Cambourne which would benefit immensely from a better link to Cambridge. Like the DLR, there’s a lot of potential for rapid expansion. Going as far as Northstowe in the initial (almost entirely intra-Cambridge) phases would assist with judging the financial benefits of these inter-settlement extensions (as well as giving Northstowe a jump start). that’s great I live in Cambourne and my patner works in Trumpington so her journey to work could be as little as 2 train rides im sure would be much cheaper than the cost of running a 2nd car over the years with running costs. i think its a great idea and would love to see it happen and hope the backing is strong enough to get it through after the shambles of the guided bus way and cost and time that took. Sadly the misguided bus was put in rather than a light railway. However now it is here I am not sure that there is a sufficient population to justify both an underground railway and the misguided bus which only benefits me through the cycleway alongside it. Given that for all serious scientists anthropogenic global warming is a reality, how long would it take for the CO2 generated by the amount of concrete etc. needed for this system to be balanced out by the car journeys cut? Fines for illegal car parking need to be increased so it is no longer cheaper to avoid paying the charges to park in the designated car parks, a congestion charge introduced between 0700 and1900 and a lot more money spent on introducing a system of cycle lanes to rival Dutch and Danish systems. It’s sad that, with the guided busway, the opportunity was missed to create a form of transport that wasn’t affected by the poor road system in Cambridge. I think it would be worth running the numbers, as tens of thousands of people commute into Cambridge from all directions – a disproportionately large number compared to most places. I also wonder if such a system would allow companies to create more jobs due to changes in accommodation and transport arrangements and costs. I would support a real cycle lane system (rather than just red-painted edges of roads) as a short term solution or part of a longer-term solution but the main routes in and out of Cambridge simply don’t have enough width. It also doesn’t help people with commutes too long to cycle – this group will increase in size as the number of jobs in Cambridge increases and construction of residential accommodation on or near the city’s edges is resisted. The long-term solution (which is what one should be looking to implement with £1billion) would be to deal with this future rather than the present. I haven’t said anything about the nature of the stations (well, I did in my ITV interview, but they showed a grand total of 5 seconds of that). My reason for using green spaces in the city centre is so that a sub-surface station can be built underneath some of the green space with minimal disruption. The only change on the surface would be some steps leading down into the station. Even if you wanted surface-level station buildings for some reason, there’s no reason the building would need to be on a different scale to the public toilets already in our green spaces (e.g. Midsummer Common, Parker’s Piece, Christ’s Pieces). I haven’t heard complaints about those. Elsewhere, where there are buildings that could do with replacing, station buildings could be erected. That weird road island thing that the Chesterton Staples is on has always struck me as something far better suited to having a station. While I’m on the subject of green space, I think a lot of the green space in Cambridge is used poorly. Much is college-owned or compact, while the largest expanses (the commons) are effectively fields with little in the way of maintenance, facilities or notability. Other cities do far better in this area, and it’s not as if Cambridge has a lack of resources. A tunnel is definitely feasible. About 20 years ago it was the chosen method of making a new main drain from Riverside to Milton – over 3km long, and none of it cut-and-cover. It’s under or near (for example), Chesterton Recreation Ground, Scotland Road, Green End Road, and Green Park. The drain is 2120mm diameter which is pretty big: not big enough for transport, but surprisingly close. I think around 2500mm diameter would be enough for the PRT system (*) serving Heathrow terminal 5. I’ve been told that it could cost about 3 times as much per kilometre to put that system underground rather than overhead, which is acceptable where there’s no choice but it does mean that overhead should be used where possible. A constraint for a tunnel route is the need for lift shafts at the stations. My initial suggestion would be Railway Station, Gonville Place (under the car park? ), Grand Arcade/Drummer Street (there’s apparently already some provision for underground connectivity between them), Park Street (as part of the redevelopment of the car park), Adam&Eve Street (for the Grafton area and Anglia Ruskin), Beehive, and back to the Station. It could do with another in the Mill Road area – perhaps in the development of the Council Depot site. Whatever one thinks about the Guided Bus, I don’t think it makes sense to duplicate it south of the railway station, but it does make sense to join the two sections. There should be scope for some of the northern part of the PRT system to be overhead, but the need to link it to the in-town section means that space has to be found for the transitions between under- and over-ground. Perhaps Park Street, Midsummer Common, Cheddars Lane (all underground), Stourbridge Common, Chesterton Station (transition at one of these), then Science Park, Regional College, Orchard Park, NIAB-site development, University NorthWest site (all overhead), Madingley Road park&ride, University WestCam site (transition at one these), and back to Park Street. It could do with one in the Grange Road/Queens Road area but space might be difficult to find. That’s deliberately one clockwise loop and one anticlockwise loop: if each was one-way only (to save money!) then the worst case journey time might be around half an hour. I don’t know how that compares with a bus ride, for example from the station to West Cam?